Wisconsin's Ricky Robertson puts Northwestern's Mitch Sliga in a precarious position. 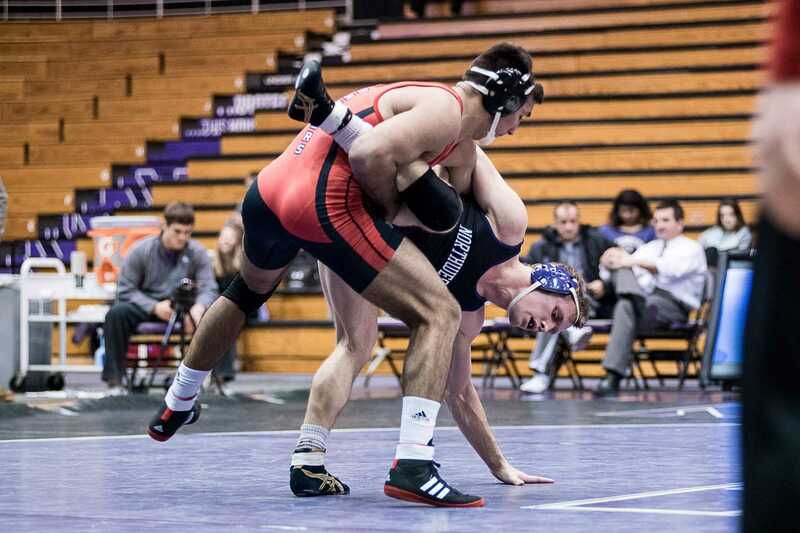 Trouble spots were a familiar theme for the Wildcats on Friday night, as three NU wrestlers were pinned in a 30-16 loss to the Badgers. The home environment did not help the Wildcats on Friday night, as the team dropped another Big Ten contest. Three Northwestern wrestlers got pinned in No. 18 NU’s 30-16 loss to No. 11 Wisconsin (6-1, 4-0 Big Ten) at Welsh-Ryan Arena, and No. 2 heavyweight senior Mike McMullan was defeated. The night actually started out well for the Cats. The meet opened with the 149-pound weight class, in which NU (8-3, 0-2) seems virtually unstoppable. The Badgers’ Rylan Lubeck took on No. 1 sophomore Jason Tsirtsis, the defending NCAA Champion, but walked away as all of Tsirtsis’ past 37 opponents had — in defeat. Tsirtsis advanced to 22-0 on the season with a 6-1 victory and gave the Cats an early 3-0 lead. NU’s luck went downhill from there. Sophomore Ben Sullivan and No. 7 senior Pierce Harger suffered falls in the next two matches to Jarod Donar and No. 3 Isaac Jordan. Sullivan was pinned directly after having his leg looked at and then limped off the mat. As for Harger’s pin, it was a similar cruel twist in fate. The half concluded with two more defeats for NU: A forfeit at 174 pounds and a 4-0 loss by redshirt freshman Mitch Sliga at 184 pounds to Ricky Robertson. NU entered halftime down 21-3. Senior No. 12 Polizzi at 197-pounds won a nail-biter after the break over No. 10 Timmy McCall. After falling behind 6-4, Polizzi pulled a reversal to get 2 points and scored the riding time point to win a 7-6 decision. Next came one of the night’s biggest blows, McMullan lost 7-6 to No. 5 Connor Medbery in a thriller. Medbery pulled ahead early 3-0 with a takedown and an escape, but McMullan fought back to tie it up 4-4. Down 6-4, McMullan got a reversal to tie it up in the final minute, but he ultimately could not maintain control and Medbery escaped with about 15 seconds left to come away victorious 7-6. Next NU won the 125-pound bout by forfeit, but No. 20 Dominick Malone, a junior, was pinned by No. 14 Ryan Taylor at 133. In the final matchup, junior Jameson Oster turned in NU’s best performance of the night with a 16-5 major decision over Jesse Thielke at 141. But it was too late. The Wildcats were already down 30-12 and his 4 points were not enough to close the gap. Correction: A previous caption of the above photo misidentified the Northwestern wrestler pictured. It is Mitch Sliga. The Daily regrets the error.